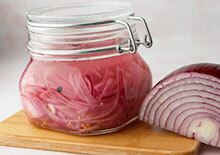 An Easy Lacto-Fermented Style Recipe Making your own lacto-fermented pickled red onions is a super easy process. All you need are a few basic ingredients: onions, salt, pickling spices and a culture starter. Compared to other fermented food recipes, this one doesn't involve special food-specific cultures but can be made with any probiotic supplement powder. After fermenting them for about a week they will develop a nice soft sweet pickled taste that also takes on whatever spice flavorings you incorporate into the recipe.